Pure vanilla, with its wonderful aromatic flavour, is the most widely used flavouring in icecream, pastries, confections, and other desserts. It is the second most expensive spice in the world, next to saffron, because growing the vanilla seed pods is labour-intensive. 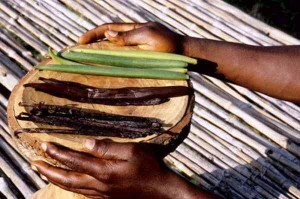 Vanilla is one of the most complex tastes in the world, with over 250 organic components creating its unique flavour and aroma. And as much as flavour chemists try, the cheaper synthetic vanillas on the market today do not come close to competing with pure vanilla. As you learn about vanilla you start to appreciate why it is so expensive. It begins with a cream-coloured orchid, the only orchid of about 20,000 varieties that bears anything edible. 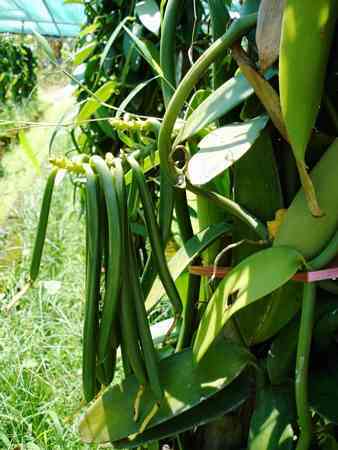 Vanilla was completely unknown in the Old World before Columbus. Spanish and Portuguese explorers arriving on the Gulf Coast of Mexico in the early sixteenth century brought vanilla into Africa and Asia later that century. The word “vanilla” comes from the Spanish word “vainilla” which means “little pod” or “little sheath”, referring to the pod’s long thin shape. Vanilla is native only to Mexico it took until the 19th century for botanists to figure out how it could be grown commercially in other tropical climates. The vines would grow, but would not fruit outside of Mexico. 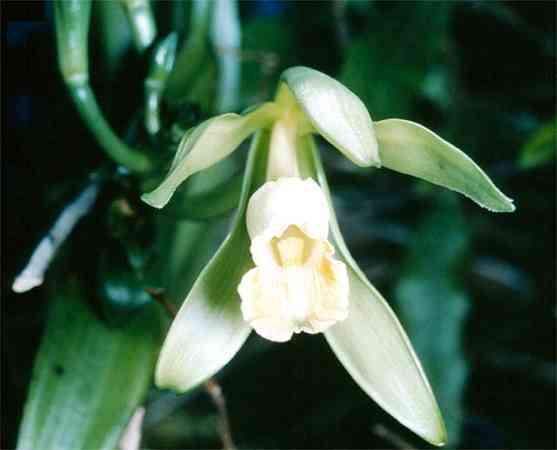 The problem was that this orchid, in order to produce the vanilla pods (beans), needs to be pollinated by a specific Melipone bee found only in Mexico (abeja de monte or mountain bee). This bee provided Mexico with a 300 year long monopoly on Vanilla production and it wasn’t until “hand pollination” of the flowers was developed that could be successfully grown in other places. 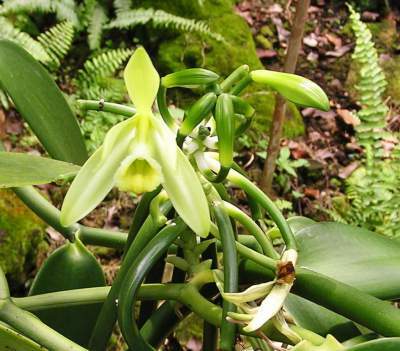 The thick, green orchid vine (Vanilla planifolia) grows wild on the edge of the Mexican tropical forests. 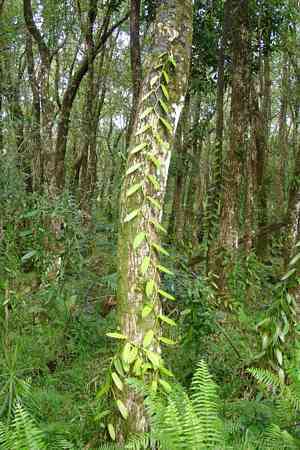 The vines will grow up to the top of tall trees in the jungle. Left alone, it will grow as high as possible on the support, with few flowers. Every year, growers fold the higher parts of the plant downwards so that the plant stays at heights accessible by a standing human. This also greatly stimulates flowering. Three years are required for cuttings to grow enough to produce flowers and subsequent pods. Not all the flowers are hand pollinated though. They are thinned out so as to guarantee good quality beans, albeit fewer in quantity. A vine remains productive between 12and 14 years. 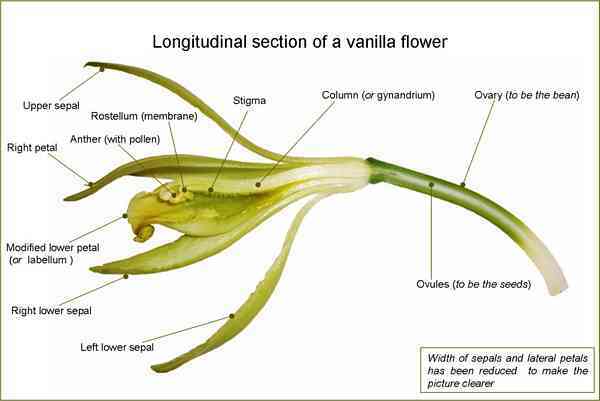 The vanilla flowers are hermaphroditic: carrying both male (anther) and female(stigma) organs, however, a membrane separates those organs. Workers lift the membrane with a small splinter of wood or a grass stem, then, using the thumb, transfers the pollen from the anther to the stigma. The flower, self-pollinated, will then produce a fruit. The flower lasts about one day, sometimes less, and so, growers have to inspect their plantations every day for open flowers, a labour-intensive task. It grows best in hot, humid climates from sea level to an elevation of 1500 m.
The ideal growing conditions are moderate rainfall, 150-300 cm, evenly distributed through 10 months of the year. The optimum temperatures for cultivation are 15-30°C (59-86°F) during the day and 15-20°C (59-68°F) during the night. Ideal humidity is around 80%. 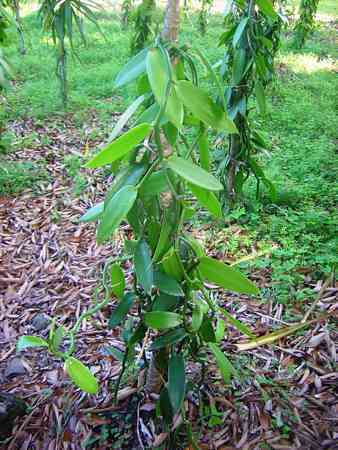 Soils for vanilla cultivation should be loose with high organic matter content and loamy texture. They must be well drained, and a slight slope helps in this condition. In the tropics, the ideal time for planting is from September to November, when the weather is neither too rainy nor too dry. Cuttings take 1 to 8 weeks to establish roots and show initial signs of growth from one of the leaf axils. A thick mulch of leaves should be provided immediately after planting as an additional source of organic matter. After hand pollination, the flowers develop into longthin green pods or beans that can grow up to 12 inches (30 cm) long. Average length is about 8 inches (20 cm) long. 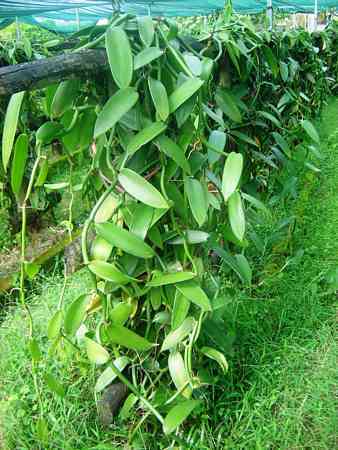 The vanilla bean grows quickly on the vine, but is not ready for harvest until maturity – approximately ten months. Harvesting beans is as labour intensive as pollinating the blossoms. Each bean ripens at its own time, requiring a daily harvest. To ensure the finest flavour from every bean, each individual pod must be picked by hand just as it begins to split on the end. It needs a process of curing similar to cacao to develop its characteristic aroma. The beans are first plunged into hot water to stop the vegetative growth of the pods and initiate enzymatic reactions responsible for the aroma. The sweating process consists of wrapping the beans in woolen cloth to raise the temperature of the beans under sunlight conditions for one hour, for up to 10 days. During the remaining time, the pods are stored in wooden boxes under air-tight conditions. These conditions allow enzymes to catalyze the reactions involved in generating the characteristic vanilla colour, flavour and aroma. To prevent rotting and to lock the aroma in the pods, the pods are then dried. Often, pods are laid out in the sun during the mornings and returned to their boxes in the afternoons. Finally, the beans are aged to bring out their full flavour. The entirecuring process can take up to two years. During this process the beans become a very dark browncolour and develop a white crystalline substance (or frost) on the outside of the bean, called vanillin. The vanillin is what gives the beans their wonderful flavour and aroma. The cured vanilla beans contain an average of 2.5% vanillin. 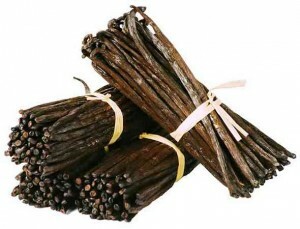 Vanilla is graded into different categories, mostly depending on the length of the bean, since there is a correlation between length and vanillin content. 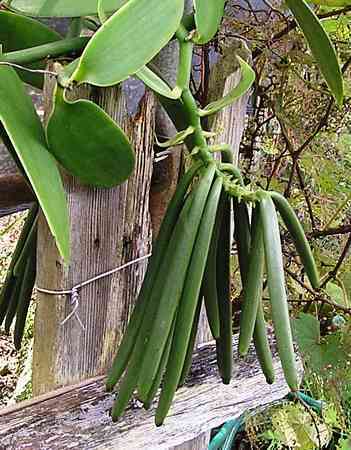 Once dried and cured the vanilla pods need to be kept airtight to retain their wonderful flavour. Vanilla: Cooking with one of the world’s finest ingredients: Cooking with the king of spices. Brought to Europe by Spanish explorer Hernán Cortés in the 16th century, vanilla became something of an obsession for Queen Elizabeth I. Later known as ‘black gold’, for vanilla’s rarity was more precious than gold, it has in recent years lost its lustre and become synonymous with all things bland. This book seeks to re-establish vanilla’s lofty perch as one of the most exciting and cherished ingredients on the planet. The book will show you how to use this wondrous spice in a fantastic array of cakes, such as Elderflower and Almond Cake as well as delicious desserts like Persian Rice Pudding. Why not sit back and enjoy a rich, velvety Vanilla Hot Chocolate from the drinks section? You can also inject a little bit of magic into teatime treats with the heavenly Vanilla Scones. If you’re looking for something a little different, why not try one of the sensational savoury dishes to delight and surprise your dinner guests? These dishes showcase the extraordinary versatility of vanilla – truly the king of spices. Spain Info vanilla, San Francisco De Asis, Urb Marina, San Fulgencio, 03177, Alicante, Spain. 38n21, 0w29.